Act fast. This is exactly the time of year when you can pick up a bit of a bargain on a new caravan, as dealers seek to clear their 2015 stocks in time for next season. Chances are, such vehicles will be one-offs – so you may need to be a bit smart. That also means not rushing into a panic purchase. So, if you thought something like this smart Lunar Clubman SE was a tiny bit beyond your budget at the start of the season, how about a rethink? Few names are as evocative as Clubman when it comes to caravanning. It just conjures up visions of rallies, touring together and all that’s good about the peripatetic outdoors. With a pedigree amassed over four decades, perhaps it’s hardly surprising, then, that even the latest look of this Lunar is pretty traditional, with a three-windowed front and a large front locker hatch. Minimal graphics, too. Alloy wheels, as here, always help spruce things up, while there’s also the reassurance of Al-Ko’s ATC system and stabiliser, plus a receiver for an Al-Ko Secure wheel lock. More, the Clubman comes with a Phantom tracker and a PIR alarm system. It’s a more traditional stable door here, too, with window. Overhead, there’s a modern LED strip light with curved guttering. Inside, it’s a contemporary popular end washroom/French bed floorplan that also manages a decent enough lounge and a kitchen that doesn’t want for equipment, storage or even worktop. The thing about this 2015 Clubman SE is it addresses pretty much all of the criticisms levelled at its predecessors. 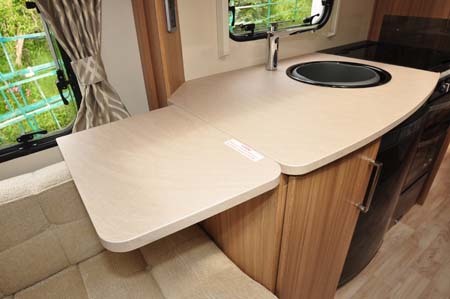 Kitchen worktop is enhanced thanks to a flip-up extension to its left. Interior lighting – direct as well as ambient – is all-LED. The toilet is a more upmarket ceramic bowl version, from Dometic. The shower cubicle boasts a couple of corner shelves – small but so useful. There are slide-out storage racks in the kitchen’s main cupboard. It’s quite some list and, in every case, it’s hard to argue against. One feature that does divide the critics, though, is that long, slim opening rooflight spanning both lounge and kitchen. Of course, without such a feature at the very front, the Clubman can offer much more in terms of overhead locker capacity. Seating comfort is certainly top-level, and converting the settees to a second, transverse double bed measuring some 2.10m x 1.67m. An alternative, if you have small children, is to make two longitudinal singles, 1.67m x 0.74m each. 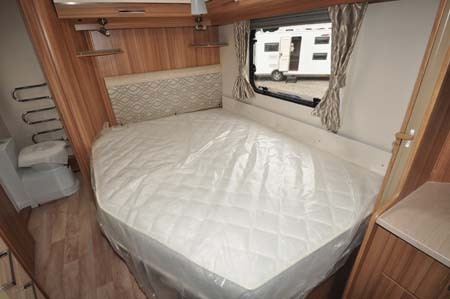 The main bed is, of course, the French (ie cutaway) double towards the rear. Don’t like that fixed bed formula? Consider the Clubman’s otherwise identical island bed sister, the SI. Indeed, Lunar has things pretty well covered with a total of five different Clubmans currently. 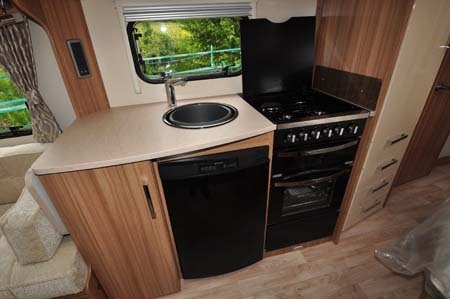 The SE here certainly has an impressive kitchen, with the chef having easy access to a cooker with dual-fuel hob and separate oven and grill, Dometic 8-series fridge with removable freezer compartment, and a neat bank of overhead lockers that even includes a designated drinks cabinet. 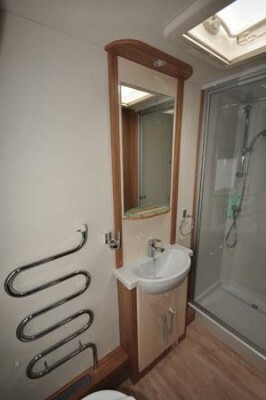 There’s also easy access to the washroom, where you get a full, plastic-lined shower cubicle (with Ecocamel showerhead and hanging rail, but no roof vent), heated towel rail and a washbasin that’s deep but not particularly large. Unlike so many models, the Clubman has even stayed trim over the years. Despite plenty of luxury kit on board, it still only weighs in at a maximum 1,450kg. And that’s despite extending the luxury to items like the Alde heating and hot water system. Is it a classic end-of-season bargain? This example was down from £23,144 to £20,879 at Broad Lane Leisure in the Midlands. Over to you. There’s more information on the Clubman range on the Lunar website.To find out more about our low-cost premiums visit the caravan insurance discounts page. 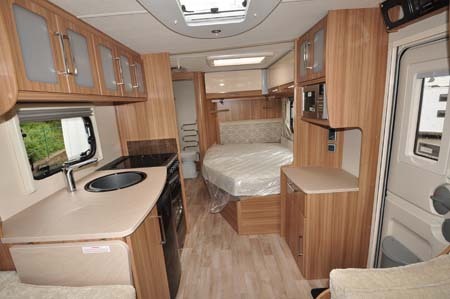 Alternatives: Bailey Unicorn Valencia, Compass Rallye 540, Sterling Continental 570/Swift Elegance 570. 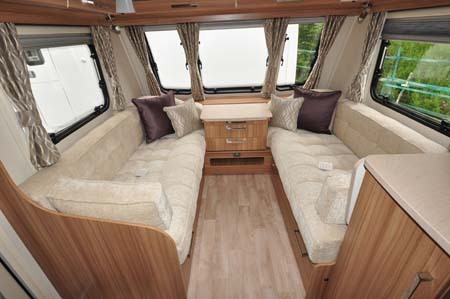 *Caravan insurance cost based on Lunar Clubman SE caravan retailing at £23,144 fitted with hitchlock, alarm, AL-KO secure wheel lock, AL-KO ATC and Phantom tracking device. Kept on drive at HX4 0BE. 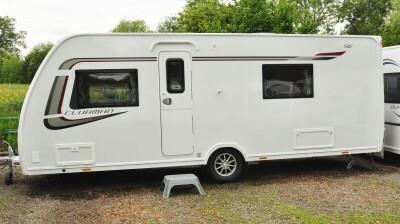 Caravanner aged 30 years old, claim free for 3 years and a member of a caravanning club. £100 excess. 180 days European cover and up to £75 per day for up to 15 days emergency accommodation cover included. Legal expenses cover, extended European cover and other emergency accommodation expenses cover options are available at extra cost. Quote includes 10% online discount and 6% Insurance Premium Tax and is correct as of 11/05/2015.